If you have a water intrusion issue in your basement, an unusually waterlogged front yard or backyard, or a yard that slopes toward your home, you should consider installing a French drain. 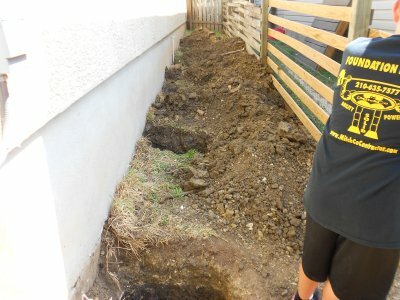 Contact your local foundation repair contractor to learn more about French drain installation in San Antonio . Also, be sure to discuss with your professional about other waterproofing methods for your basement. Water can damage or weaken your home’s foundation. A French drain can be used to protect it from water intrusion and damage. Basically, a trench is dug that slopes away from your home. Then it’s filled with a base layer of crushed rock or gravel. A perforated pipe, which is meant to direct and channel ground and surface water away from your home’s foundation, is laid on top of the base and is then filled around with more gravel. If you have surface water issues, install a shallow French drain, which can effectively channel surface water around areas that have become overly wet. These shallow drains are positioned directly above wet areas that need to dry out. If trees or shrubs come into contact with a French drain’s path, solid pipes are used rather than perforated ones. Tree roots can grow into perforated pipes and clog them. If water is infiltrating your basement, install a deep French drain, which should run around the perimeter of your home near its foundation’s footings. This drain effectively stops water from entering your basement. It’s easiest to have this drain installed at the same time a home is being constructed. If you need to have this drain installed around an existing home, it can be quite costly due to the amount of work involved, and potentially needing to have decks, walkways, or landscapes that get in the way demolished. Like a deep French drain, an interior drain stops water from entering your basement. It’s a much better waterproofing method than a deep drain. If your basement is unfinished, the installation can be a breeze. If your basement is finished, your foundation repair specialist has to cut and remove drywall in order to install the interior drain. This method utilizes a collection tank and a sump pump to redirect water from your basement.